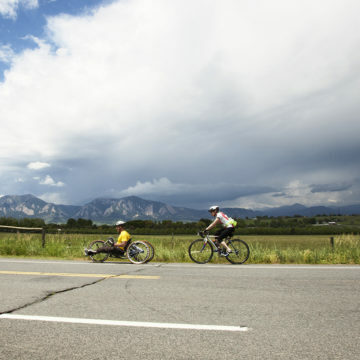 Englewood, Colo.— Craig Hospital, a world-renowned center for specialty rehabilitation and research for people with spinal cord injury and traumatic brain injury, will host Pedal 4 Possible on Saturday, June 18, 2016. The charity bike ride, presented by LogRhythm, will feature courses for all skill levels, including a 10K, 50K, 100K and 100 mile route. All cyclists will start and end at the Pearl Izumi Corporate Headquarters in Louisville. Many Craig Hospital patients and “graduates” will be participating in the ride, including Craig outpatient Justin Pines. Pines sustained a severe spinal cord injury, broken ribs, a fractured sternum, and a collapsed right lung in a ski accident in Tahoe in April. On the 10-week anniversary of his accident, he hopes to ride the 50K Pedal for Possible course on a handcycle. He has raised nearly $15,000 for Craig Hospital from his friends and family. Pines plans to begin his ride at 8 a.m. and is available for interviews about his experience at Craig Hospital and with the ride. Justin Pines, Craig outpatient, will ride on the 10-week anniversary of his accident. Media wishing to attend are asked to call Jordan Ames at 720-231-0267. Interviews, b-roll and still photos will be available on the afternoon of 6/18 for media outlets unable to attend.